Build your own coaster with KNex. KNex construction toys are a modern form of Tinkertoys that include various sizes and tensile strengths of rods that connect to different sizes, shapes, and orientations of connectors to create buildings, robots, and even roller coasters. Invented by Joel Glickman, these toys have expanded from just a few simple kits to more intricate models using pulleys, motors, gears, hinges, and other specialty parts to create ever more challenging and impressive designs. KNex roller coaster models are not only fun toys to construct, but they can also be educational. Using various concepts from physics and engineering, aspiring roller coaster designers can experiment with new coaster configurations, track layouts, and design elements by using different KNex kits to make their most thrilling creations come to life. Appropriately enough, KNex Industries, Inc. is based in Hatfield, Pennsylvania, just north of Philadelphia and within easy driving distance of several major amusement parks, including Dorney Park and Hersheypark. There are several different types of KNex coasters for eager thrill seekers to build. Each one offers unique challenges and different track layouts, and detailed instructions include alternative track designs to demonstrate the wide range of variations available. 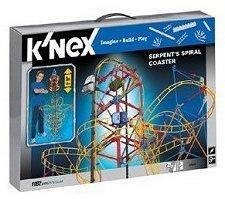 Serpent's Spiral Coaster: This is one of the most intense KNex coasters available and includes more than 1,100 construction pieces. The motorized chain lift propels cars to the five foot summit before they plunge through more than 38 feet of track. Two AA batteries are required but not included. Renegade Run Coaster: This 675 part coaster is one of the most familiar KNex designs and reaches a maximum height of three feet with more than 19 feet of winding track. 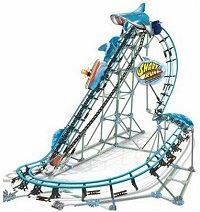 Shark Run Roller Coaster: This surfing-themed coaster features more than 620 pieces to create a track more than four feet long. The chomping shark at the peak of the motorized lift hill adds another element of fearful fun to the ride. Vertical Vengeance Coaster: This massive coaster construction kit is more than five feet tall when completed and uses a larger number of components to give the 33 feet of track even more intricacy. Loops, spirals, dips, and curves create an imposing layout, and an added feature of this model is the recorded coaster sounds and rider screams that add fun and frivolity to the final layout. KNex Education Roller Coaster Physics: This kit with more than 2,000 pieces is designed to create an eight foot tall adjustable coaster that teaches fundamental physics concepts and allows students to experiment with different layouts. In addition to the KNex roller coaster kits, there are also several other thrill ride kits available, including single and double Ferris wheels, a swing ride, and a carousel. All kits include motors so the final rides are as active as the ones eager riders board in amusement parks. To build a KNex coaster, eager architects should first attempt to build the intended layout and design. This will help them gain confidence and familiarity with the way different pieces fit together and interact in the final design. After successfully creating the given models, many builders combine different coaster kits to create more unique, larger, and more intense coasters. Using multiple lift hills can give a coaster more height, but be sure to test individual sections during assembly to ensure the coaster can complete the track without rolling back, getting stuck, or derailing. KNex roller coaster kits are available at all major toy retailers and range from $30 to $200 depending on the size and intricacy of the model. Older designs may be more difficult to find but can often be found through online auctions or used sales. Buyers should be cautious about purchasing a used kit, however, because a single missing piece can derail the finest construction design. Because of the flexibility of the KNex construction kits, many competitions have been arranged for coaster enthusiasts to create their own unique designs. In December 2007 ten-year-old Ian Culhane won a $10,000 grand prize offered by KNex Industries, Inc. for his seven foot coaster design that used more than 6,000 construction pieces. Other coaster enthusiasts take pride in making replicas of existing coasters or trying to break height, speed, or length records with their KNex constructions. A KNex roller coaster is only limited by the imagination and ingenuity of its architect. From small, fun designs to monstrous scream machines, combining kits and experimenting with new and unique ways to build a roller coaster is a popular pastime among both coaster fans and construction enthusiasts.